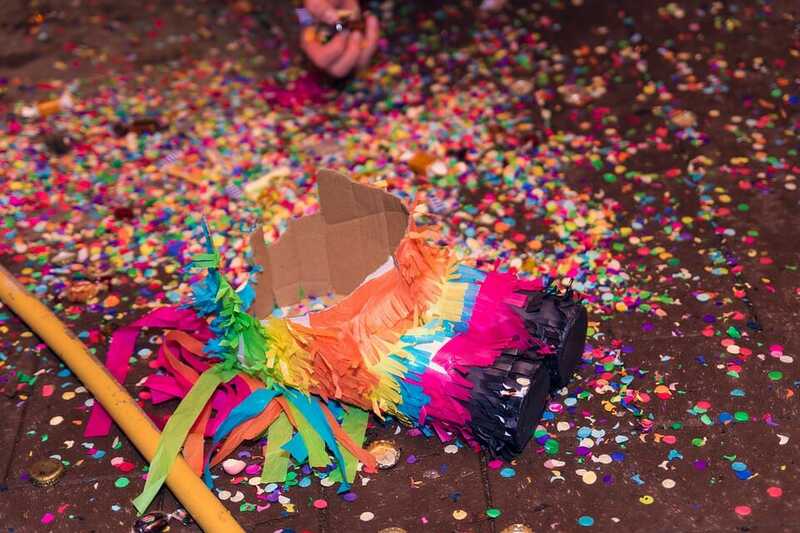 Piñata’s originated in Mexico and are used to celebrate a special occasion like Christmas or New Years. Children love to have them at parties but I find that adults find them fun and challenging as well. They are usually made of paper machete and are filled with small surprises that wind up on the ground after the Piñata is smashed by someone with a bat. Usually, the person with the bat is blindfolded and gets 3 turns to hit the Piñata. After 3 turns it is someone else’s turn to hit the Piñata until the Piñata is finally smashed and it’s content to fall to the ground. Then everyone gathers up the surprises. The prizes are usually candy, gum or small toys. It’s a fitting addition to any type of party, birthdays, college graduation, etc. Piñata’s are hung up high in an area that is large so the spectators can move safely out of the way from the person with the bat. Outside on a tree limb or in a large basement room is a good place to hang a Piñata. They can be messy when broken so don’t do it anywhere that might not be able to take a little mess. To make a Piñata you will need newspapers, flour, water and some kind of base. The base can be a balloon or box or anything you can set your imagination to. It is like the skeleton of the structure you will be making. A Piñata is usually an animal like a donkey or turtle but can be anything you can create. It is best to start easy like a balloon for Santa’s head. Paper towel rolls can be used for arms and legs of animals by first attaching the roll to a balloon with tape where you would want the legs to be. After you decide what you want to make and you have some kind of form to put your paper machete on, like a balloon you are ready to start the messy part. It is very messy to make a Piñata so find a place to make it that can get messy and wear work clothes so you don’t mind them getting dirty. You will be surprised how well a little flour and water can stick to things. To make a Piñata you will need newspaper cut in half-inch strips, water, flour and the base of your choice, like a balloon. Take about 2 cups of water and mix in a cup of flour till you make a nice runny glue. Dip a newspaper strip into the glue and place it on your chosen base as flat as you can get the wet paper to lay. Repeat putting wet newspaper on the base till the entire base is covered and feels sturdy. The thicker you make the walls of your Piñata the harder it will be to break it so don’t hesitate to put on several layers of paper. You should have something that resembles what you want to make when it is all covered. You can make some parts completely out of the wet paper, like a nose. Let the Piñata dry. It may take overnight. When the Piñata is dry it is time to put in the surprises. 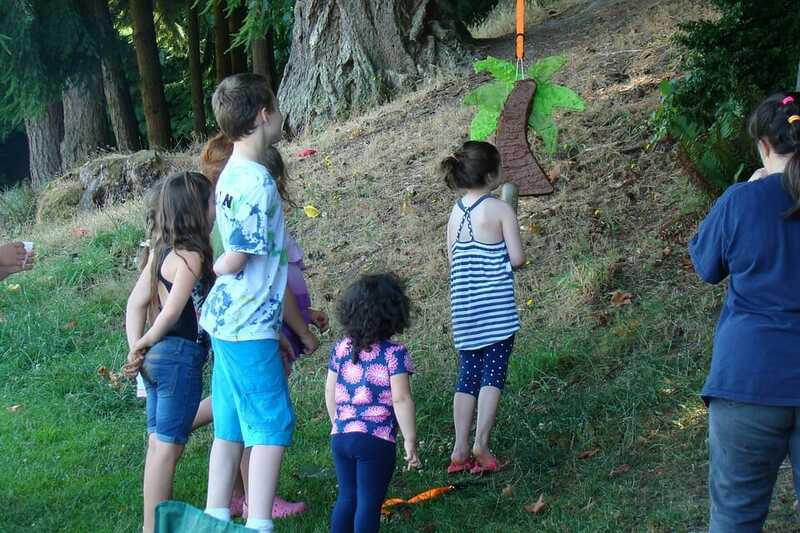 Take a knife and carefully slit the Piñata in an inconspicuous spot, make the slit large enough to push the surprises through to the inside of the Piñata. If you used a balloon the balloon may pop but the paper machete should be ok. After you have put in the surprises take a piece of paper large enough to cover the slit and glue it over the slit. After the glue dries you are ready to paint your Piñata. Or cover it with small pieces of paper glued into place. Use small paper for eyes, nose, mouth, ect. You can get creative at this point to make your finished product. When the Piñata is dry you can hang it up for a decoration till it is time to break it open. But remember – safety first! Keep guests away from the person with the bat.